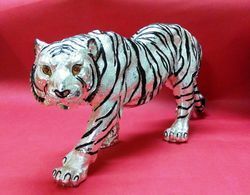 We are a leading Manufacturer of silver plated tiger statue from Mumbai, India. At our well-established production unit, we present Silver Plated Tiger Statue to our valued clients. Under the strict vigilance by our professionals, the offered silver tigeer is manufactured by skilled professionals. The offered silver tigeer is manufactured using pure silver and advanced technology. Moreover, the offered silver tigeer is tested on various quality parameters to assure authenticity and purity. Apart from this, clients can get the silver tigeer from us at industry leading rates.